The Chesapeake Bay Bridge-Tunnel, the longest bridge-tunnel complex in the world. Thunderstorms are a regular occurrence, and the state has an average of 40 days of thunderstorms per year. An incredible amount of American history is deeply entrenched within the beautiful confines of the Commonwealth of Virginia. 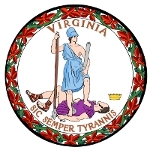 In 1607, the London Company founded the colony of Virginia. The newly established colony served as the very first permanent English settlement in the new world. This ground-breaking establishment was unfortunately kept afloat by native American land and slave labor in its early years of existence. 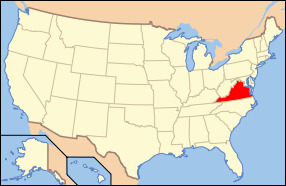 After establishing a firm plantation based economy, the London Company determined that Virginia was stable enough for permanent settlement by fellow Englishmen. The establishment of Virginia as America's original colonial settlement remains an unparalleled occurrence, but is only a small deposit in the state's bank of historical fortune. In addition to Virginia's incredible past is an alluring set of geographical features that are sure to appeal to visitors of all demographics. Located just south of our nation's capital in Washington, D.C., The Commonwealth of Virginia is deeply saturated with historical treasures. Often referred to as the “Mother of Presidents”, Virginia is the proud birthplace of eight United States Commander-in-Chiefs. While visiting the proud state of Virginia, finding your way over to Charlottesville is briskly encouraged. Charlottesville possesses sustained natural beauty within its city limits; something that has become an increasingly rare feature among travel destinations. This majestic Virginian city is home to a number of beautiful must see vineyards and orchards. Without a close comparable second, Thomas Jefferson's home at Monticello in Charlottesville is the town's number one draw. The Monticello home is considered an architectural masterpiece and is beautifully placed upon a mountain. Designed by President Jefferson himself, the home at Monticello is incredible. Tours of the home and outlying lands are offered year round. A number of nationally protected parks are found in the Commonwealth of Virginia. Virginia's Parks were recently elected as “America's Best” by the Sports Foundation and the National Recreation and Park Association. The state's aesthetically stimulating national parks provide a very diverse set of entertainment options. Whether whitewater rafting, climbing majestic mountain peaks, or taking in mother nature on an overnight camping trip, Virginia's nationally acclaimed parks are sure to provide an unforgettable experience. Virginia, or the The Gateway to the South, is home to scream enticing theme parks and exotic zoos. The Commonwealth of Virginia is a fantastic travel destination for just about anyone. Virginia's unparalleled history, jaw-dropping diverse topography, beautifully preserved national parks, zoos, and theme parks provide a can't miss tourism experience. So whether you choose to challenge your stomach by riding a breath-taking roller coaster or decide to feed your historical cravings in one of Virginia's many museums, excitement awaits you in America's first colony.